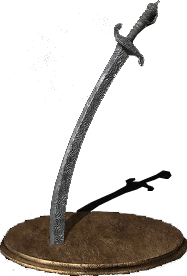 Carthus Curved Sword is a Weapon in Dark Souls 3. Slice into foes with a large spinning motion, and continue spinning to transition into strong attack. Uses slightly more stamina per swing than most other Curved Swords. Most noticeable when two-handing. Dropped by Skeletons using them in Catacombs of Carthus. Easily farmed by taking the Catacombs of Carthus bonfire. Go straight and wait for the skeleton ball to go by, go right towards where the ball came from then quickly left. There are 2 skeletons that spawn here with the sword. The dark and chaos infusions give you A/A scaling at +10. RIP the legend, it has been 2 years and in a game now dominated by 1 handed straight sword r1&apos;s and rampant unpunishable rolling, your unique attributes have been sorely missed. I think the sharp scaling got changed. Sharp at +0 raises the dex scaling to a B right from the start now. This sword should be called "Tryhard Miyasaki"
This used to be a good weapon before getting nerfed, it wasn&apos;t really op at all. then a bunch of idiots who couldn&apos;t handle it in pvp had to complain to From Software about it and get it nerfed. Twice. After all the time and effort I&apos;ve put into getting and upgrading it, it just isn&apos;t that good anymore. It doesn&apos;t even matter if it&apos;s just gonna be used for pve, the stat reduction still applies. I really feel I&apos;ve ripped off of both money and time. So what I&apos;m going to do is &apos;nerf&apos; From Software. I won&apos;t be paying any money for any future From Software game I&apos;m going to get (if From is going to make anything worth getting from this point onward.) That way at least, I can prevent getting ripped off money. Random trivia: I believe it is the only curved sword that is sheathed on your back. Use with brigand Twindaggers for true Arabian Knight action. has less range then scimitar and demon scar. Finally, a curved sword without that godawful kick replacement. I dunno why you literally never see anyone use this anymore. It was completely broken, they rightfully nerfed it and now it&apos;s just a really good weapon. The look on the weapon, if you look closely, has a similar look on those weapons that uses Damascus steel/wootz steel as a base. This weapon isn&apos;t even that good anymore, but people continue to call it cancer and so on because they keep clinging to the past. "Easily farmed"? I spent *three hours* in the Catacombs with the SoA, SoW and CGS+3 and even got *four* Sharp Gems, but no sword! You sure this is an easy to farm sword, or is my luck just bad? This on a hollow build is the best weapon in the game. Sharp scaling is incorrect. I am currently running one sharp +7 and it&apos;s already on A scaling in dex. i want to have this as my main bleed source... does infusing it with bleed have any advantages? according to the table it has 8-10 more bleed damage than the other infusions.. or is it better to infuse it with something like sharp/heavy/refined depending on your class?? is the 10 more bleed that important? This page just got memed on. Would this or uchi be better infused bleed for a bleed build? I know this is the meta cancer but the game tells you to use this. :D I was farming for a carthus shotel. I killed the shotel wielding guys at catacombs a hundred times over. No drop. I was frustrated. I went up. Killed the first guy on my way and he dropped CCS. And later when I was going back to shrine to upgrade carthus shotel (it dropped eventually), on the loading screen it was showing the CCS. What are you trying to tell me Fromsoft?